All the Pass Master and Mark Master training footballs are Australian designed, built tough to last. That Training Ball Company is 100% Australian owned and located in Sydney, Australia. My name is Greg Goodieson, and I’ve been the President of the Largest AFL Junior Football Club in Sydney. I have over 17 years of being involved in running two very large AFL clubs in New South Wales, East Sydney Juniors and UNSW AFL Bulldogs. I have held every position including Sponsorship coordinator and Canteen and BBQ. In 2017 I was awarded – Sydney AFL Volunteer of the Year. I have been an assistant coach and know first hand the problems coaches face, both at training and on game day. I have seen players that have lacked confidence and ability… But once given a Training Ball and with a little practice.. this is now a thing of the past. After only a few minutes of kicking and catching the training ball, you will never hear again, I don’t know how to play football, I don’t know how to kick a football or I don’t know how to catch a football. Watch with Amazement in just 20 minutes… any player can and will learn the basic football skills. If you’re Serious about Improving your Football Skills… Just choose from the range of Mark Master, Pass Master and Kick N Catch training footballs available on the That Training Ball website. If your not sure what to call these footballs. We have heard people call them many names. Training football, come back ball, football trainer, ball on a string, ball on a rope, trainer ball, we don’t care what you call them. 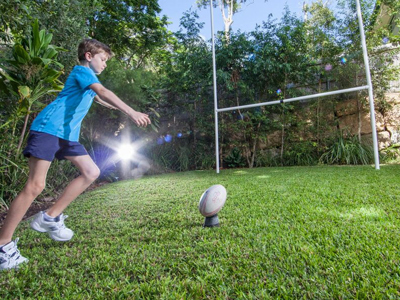 We just call them AFL, Soccer, Rugby or Rugby League training balls. In 2018 we have introduced a new ball into the collection. The Pass Master Netball trainer, this is a fantastic skills defence netball training ball. TIP: You will not find these training ball in shops. We ONLY SELL them ONLINE.